As a teacher, I encourage quilters, both newcomers and the more experienced, to enjoy the process, to gather as much knowledge as possible and to challenge themselves with new techniques and designs. With consultation, workshop length and some subject matter can be altered to meet student needs. Workshop and lecture fees and requirements can be found in the teaching contract form. A dot made with a pencil, a line created with stitch, a swirl painted with a brush, these are all types of mark making. Simple marks = effective and dramatic design! 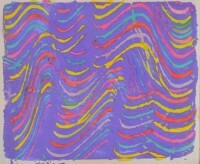 We will use a variety of methods to create marks on both paper and fabric. Using unusual tools, inks, dyes and paints we explore line, pattern and composition that we can use as personal symbols and our own unique language. 1-3 Days. Kit fee Read More . . .
We begin with marks on fabric, adding colour, pattern and texture with paint, pastes and printing. 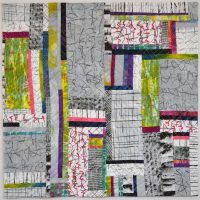 Further exploration is a second layer of pattern with stamping, stenciling or drawing into the fabrics you have created. Stitch by hand or machine creates more marks onto the surface, using a variety of threads and stitch designs. 2-4 days. Kit Fee Read More . . . Create spectacular fabrics in this workshop, all about printing! There are countless ways to make exciting designs with a gelatin plate. We will learn how to use stencils and masks, doilies, kitchen tools, print rollers and more with textile paints and explore all the possible ways to get colour onto cloth. We will also learn to make hand carved stamps as well as using found objects for more layers of colour. 1-2 Days, Kit Fee Read More . . .
Screen printing on fabric opens the door to so many possibilities. This workshop will reveal that screen printing is not difficult or expensive. We will make simple, basic screens that will meet everyone’s needs, as well as learn the appropriate paints, dyes and tools to use. Four different techniques will be covered including freezer paper stencils and other masks, soy wax on the screens with thickened dyes, Thermofax printing and using gel and glue mediums for foils and special effects. This workshop has been developed for those wishing to learn basic colour mixing theory using Procion MX dyes, the standard dye for all cellulose based fabrics and suitable for cotton, linen, silk and more. Projects will include simple colour gradations, colour to colour runs, creating neutrals and the development of a range of fabrics and threads using a planned palette showing value, tints and shades. Dye recipes will be recorded, we will learn how to reproduce colour choices and there will be a focus on safe studio habits. We will make patterns on fabrics using both compression and applied resist methods as well as simple patterning with stitch. We will explore the wonderful nuanced shades of neutrals that can be achieved with black, grey and primaries in this workshop. Our personal colour palettes will be enhanced with the addition of the warm/cool values and we will learn about the different colour casts with a variety of blacks. We will also over-dye colours with the neutrals to get a subtle variations as we work with low water immersion, shibori and shape resists. We will create a dye sample book and small yardages that can be used for a variety of textile projects. In this workshop we will learn to make and use thickened dyes as a base for printing with a silk screen. Thickened dyes do not change the hand of the fabric, allowing the fabric to remain soft and supple despite repeated applications, plus thickened dyes are transparent, so layers of dye will change intensity, value and colours, giving the artist a wide range of possible uses for their created cloth. 1-2 days. Kit fee Read More . . . Explore pattern, texture, design and colour using soy wax as a resist method on a variety of natural fabrics. We will create multiple layers of interest with dye painted resists, colour and value mixing, pole wrapping, stitch resist, and screen printing with thickened dyes using a wide variety of tools such as brushes, masks and sponges. Time will be spent learning design principles, mark making and colour theory, as well as safe studio habits. 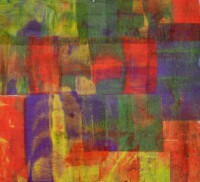 A wide variety of samples of different techniques will be made as well as larger yardage suitable for art quilts, clothing, home decor and mixed media. Soy wax is a renewable resource, kind to the environment and easy to remove with washing. 2-5 days. Kit Fee Read More . . .